Our first available material that ships with the Voxel8 Developer's Kit Printer is a highly conductive silver ink formulated for printing 3D electronics. It cures at room temperature without additional heat, additives, or processes. It possesses very superior characters for electrical conductivity over competitors in this space, which makes it ideal for 3D printing electronic trace using additive manufacturing techniques (i.e. "3D Printing"). The Voxel conductive silver ink comes in barrel syringes as seen in Picture 001, below. Picture 001: A single barrel syringe of Voxel8 conductive silver ink. The Voxel8 silver ink has a bulk electrical resistivity below *3.0x10-7 Ω-m. The ink is 20,000x more conductive than conductive filled-thermoplastic filaments and more than 5000x more conductive than existing carbon-based inks at this time (see Picture 002). Highly conductive inks are required for fabricating 3D electronics that have large operating currents such as projects you'll fabricate on the Voxel8 Developer's Kit Printer. Picture 002: Conductive Materials Resistivity Comparisons. The Voxel8 silver ink is designed to be self-supporting. When dispensed it can hold its filamentary shape, span gaps, and adhere to pins on electrical devices. We have more info in our tips & tricks section about this feature of the ink. 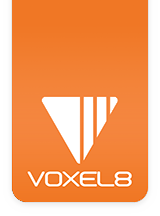 Voxel8 silver ink dries quickly at room temperature yielding highly conductive electrode traces and interconnects without the need for thermal annealing. Hence, our conductive inks can be co-printed with a wide variety of thermoplastic materials. The Developer's Kit ships with several spools of PLA (Polylactic acid) thermoplastic filament. The Voxel8 silver ink is formulated for pneumatic deposition through a 250 micron nozzle. A box of these are supplied with you Voxel8 Developer's Kit printer. The pneumatic system uses compressed air, enabling controlled volumetric flow and clean starts and stops. NOTE: Depending on when your printer is received, you may have an earlier formulation of the silver ink. Bulk electrical resistivity may be different. Download the TDS (Technical Data Sheet) on the Voxel8 conductive silver ink which contains specifications on the ink (e.g. material characteristics). When using the conductive silver ink, you should follow a few key rules about it's proper use and storage pre and post printing processes. When printing multi-material prints, the ink starts curing after 5 minutes. There is a 15 minute dry time before it is recommended touching the prints. Depending on environmental conditions such as temperature and humidity this value could increase or decrease. As a recommendation, we suggest leaving parts drying for an hour or more before manipulating them to significant degree. Always be sure to recap the silver ink after printing with both blue cap ends tightly screwed and attached to keep the ink fresh and usable (see Picture 003). IMPORTANT NOTE: Failure to do this may result in a change in the required extrusion pressure, and if left for long enough, the ink may lose its ability to extruded all together. Picture 003: Properly Capped and Sealed Silver Barrel Syringe. It is recommended to wear gloves when handling the Voxel8 conductive silver (see Picture 004). NOTE: If you have not already read the SDS (Safety Data Sheets), you will want to do this right now. Picture 004: Disposable gloves are worn while working with silver. We recommend to dispose of printed parts containing silver and other electrical components to be thrown in an E-waste receptacle. Parts that contain no silver, and are PLA or ABS plastic ONLY, can be recycled as long as the thermoplastic meets recycling grade criteria. Any used silver tips that contain or are covered in cured conductive silver ink (see Picture 005) should be disposed of as e-waste. Picture 005: Silver Dispensing nozzle coated in cured silver. Blue painter's tape squares covered with cured or uncured silver (see Picture 006) should be treated as e-waste material when removed from the aluminum build plate. You should dispose of the material as you would with any other piece of e-waste electronic equipment. Picture 006: Excess conductive silver ink cured on build plate tape. The Voxel8 Safety Data Sheets accompanied your printer inside the shipping box, but the information is also available for download online. Operators of the Voxel8 Developer's Kit Printer should read these datasheets in full before printing on the machine. IMPORTANT NOTE #1: In the event that silver comes in contact with skin, operators should wash it off immediately. IMPORTANT NOTE #2: In the event a Voxel8 Developer's Kit operator gets silver in their eyes, they should flush their eyes out for several minutes using water, and see a consult a physician. IMPORTANT NOTE #3: If an operator is working with the uncured Voxel8 conductive silver a lot, gloves should always be worn. The Voxel8 capping solvent provided in the bottle with your Developer's Kit Printer (see Picture 007) is for keeping the silver from drying on the capping mechanism (Picture 008) of the pneumatically dispensed silver nozzle. Picture 007: The bottle of solvent used to clean silver nozzles during operation. There are no specifications available for this cleaning solvent. The procedure for applying the solvent is laid out in the Visual Start Guide, as well as in the support section of this site. NOTE: As with the silver ink, as a general rule, you should wear gloves when working with the solvent. If you have not read the SDS on the Wiping Solvent, you should do so now.